This paper aims to summarize the most salient features of Kivu Swahili, the variety of Kiswahili spoken in the Kivu provinces of DR Congo. It addresses the core differences between ECS (Kiswahili as spoken on the Tanzanian coast) and the Swahili from Goma/Bukavu, also taking into consideration contact-induced change and speakers’ free variations. The paper aims to illustrate the complex morphosyntax of the language, and questions the general description of the variety as a ‘pidginized’ or ‘simplified’ form of Kiswahili, due to its divergence from ECS and the peripheral location of the community of speakers. Moreover, the paper aims to address speakers’ acrolectal reference to the standard variety, and discusses this latter against a theoretical background of the ‘constructedness’ of East Coast Swahili. Some concluding remarks summarize the salient features of Kivu Swahili, and suggest perspectives on more in-depth analyses of the language. Der vorliegende Aufsatz fasst die grundlegenden Merkmale des Kivu Swahili zusammen, der in den kongolesischen Kivuprovinzen gesprochenen Varietät. Es werden die Hauptunterschiede zwischen ECS (dem Swahili der tansanischen Küste) und dem Swahili von Goma/Bukavu angesprochen, auch kontaktinduzierten Sprachwandel und die freien Variationen von Sprechern miteinschließend. Die komplexe Morphosyntax der Sprache wird skizziert, und die generelle Beschreibung der Varietät als “pidginisierte” oder “simplifizierte” Form des Swahili aufgrund ihrer Divergenz vom ECS und der peripheren Lokalisierung der Sprechergemeinschaft soll kritisch hinterfragt werden. Zudem wird der akrolektale Verweis von Sprechern auf die Standard-Varietät angesprochen, und vor dem theoretischen Hintergrund der ‘Konstruiertheit’ des Ostküstenswahilis diskutiert. Einige abschließende Bemerkungen runden die hervorstechenden Merkmale des Kivu Swahili ab, und richten die Perspektive auf eine weitere tiefgehende Analyse der Sprache. Kivu Swahili is a variety of Kiswahili which is spoken by approximately 10 million people in the Kivu Provinces of eastern DR Congo and through parts of Maniema and the southernmost parts of Ituri District, Oriental Province (see Map 1). The Swahili spoken in the Kivus is part of a dialectal continuum of the three closely related varieties of Goma (North Kivu), Bukavu (South Kivu) and to some extent also Kindu (Maniema), spoken alongside other languages such as Kinyabwisha (JD60), Mashi (JD53), Kilega-Shabunda (D251), Kihunde (JD51),  French and many more. Kivu Swahili forms one of four distinctive regiolects of Kiswahili in the DR Congo, the others of which are Kisangani Swahili (see Nassenstein 2015), Bunia Swahili (Dimmendaal & Nassenstein in preparation) and Lubumbashi (Katanga) Swahili (see Ferrari, Kalunga & Mulumbwa 2014, among others). While coastal varieties of the language, henceforth ECS, have been extensively studied since Krapf & Rebmann’s Swahili grammar (1850), as well as the studies by Sacleux (1909) and Steere (1894) on the Kimvita dialect of Mombasa, and the Kiunguja dialect of Zanzibar respectively (see Miehe 1995), so-called ‘up-country’ varieties have remained largely understudied. Kiswahili varieties as spoken and diffused in the DR Congo have often been treated as incomplete or “liminal” forms of the language, prone to pidginization, simplification and expression of speakers’ lack of proficiency. Moreover, the diverging varieties of Congo Swahili have often been falsely assumed to be one homogeneous entity (see Goyvaerts 2007:26-27), in most cases entitled “Kingwana”, a colonial label which was later on) mostly used with reference to the northern regiolect(s). This was presumably after 1910 after it had first been labeled “Kingwanya” by W. Millman in the literature (see Fabian 1986:33). Data on Kivu Swahili are remarkably scarce, and the few studies available (Kaji 1982, Kaji 1985, Kaji 1992, Goyvaerts 2007)  mostly treat general features of the language, and the conditions of its emergence. While Goyvaerts (2007) acknowledges two different varieties of Congo Swahili or Western Swahili, Kingwana and Katanga Swahili, he neglects the regiolects  diffused in Ituri (Bunia Swahili) and Tshopo (Kisangani Swahili) for historical reasons. He builds on Fabian (1986) in explaining that Swahili in Katanga (former Shaba) was only introduced by the colonialists after the turn of the 20th century, for reasons of efficiency, while Swahili in the Kivus was established much earlier due to trade networks from the mid-19th century on. This claim makes sense when considering certain structural divergences between the Katanga variety and the three northern regiolects of Swahili. The Swahili(s) in the periphery has not yet been analyzed in great detail, due to the prestige of more central forms of Swahili as spoken on Zanzibar, along the East African coast and on nearby islands. Recently, more remote and peripheral varieties have also been taken into the academic focus, such as the Swahili of southern Somalia and northern Mozambique (Meikal Mumin, p.c. 2015; Clarissa Vierke, p.c. 2015). The use and status of Kiswahili in Uganda (Nassenstein 2016b) and Burundi (Belt 2010) has also been touched upon in recent studies, but no in-depth analyses have yet been provided. The present overview of the morphology and syntax of Kivu Swahili discusses some outstanding features that specifically characterize the variety of Swahili as spoken in the Kivu Provinces, and also raises the question as to why pidginization and “simplification” do not account for the Swahili varieties (and speakers) found in eastern DR Congo, due to their adaptability to more standardized forms, for instance when interacting with Swahili speakers from Kenya and Tanzania. This emblematic “reference” of Kivu Swahili speakers to ECS shows that deviations in speakers’ language use do not occur due to a lack of proficiency but due to broad flexible repertoires, whose acrolectal realization enables speakers to adapt to the form of Kiswahili spoken in a specific given context. Kivu Swahili contains noun classes 1–9, 11–15, 19; however, the rare classes 10 and 16–18 reveal some irregularities compared to ECS (see Schadeberg 1992, Mpiranya 2015). There are agreement breaks with noun class 10, mostly substituted with noun class 6 forms. Locative classes 17 (ku) and 18 (mu) are existent but function as locative adverbials/markers, not as full noun classes. All noun classes are listed in Table 1, while the specific deviations from ECS are illustrated with one example each (see examples 1–5), including the use of deviating augmentatives, which are either formed in noun class 7 in the northern variety of Kivu Swahili (Butembo, Lubero, Goma), or in noun class 11 in the southern variety (Bukavu, Shabunda, Uvira; see examples 1a–1b). Diminutives reveal no structural differences in the southern and northern parts of the Kivus; they are always formed in noun class 12 with their plural forms represented in either noun class 13 or noun class 14, with different diminutive or pejorative connotations (2, 3a–3b). Noun class prefixes 1, 3 and 18 (mu-) do not undergo syncopation as in ECS. Noun class 19, which does not exist in ECS, refers to ‘specific small quantities’ and is marked by a preprefix (hi-) to various other prefixes, as shown in Figure 1 illustrating the noun class pairings. The origin of noun classes 12–14, and of noun class 19, can best be explained in terms of contact-induced change. While several Kenyan and Tanzanian “up-country” varieties of Kiswahili reveal morphological diminutives (noun classes 12–13), which constitute an archaic pattern in Swahili as also argued by Nurse & Hinnebusch (1993:346),  in Kivu Swahili the diminutive classes are more likely to be borrowed from speakers’ multilingual repertoires, i.e. their home languages and other languages of wider use, where similar forms are found. Morphological diminutives (and pejoratives) are found, e.g., in Kinyabwisha, Mashi, Kihunde, Kinande in noun class 12, while the forms of augmentatives vary from language to language. The augmentative ki- (noun class 7) used in Goma can be traced back to Kinyabwisha, where the same class marks the augmentative (see 6a–b). The augmentative marker lu-  (noun class 11), as used in Bukavu, is most probably retained from Mashi (7b), where an equivalent form is used. The noun class prefix (h)i- is a widespread feature of Great Lakes Bantu languages (see Bastin 2003). It could be assumed that in the case of Kivu Swahili, it may either originate from Kinande as spoken in the northern parts of North Kivu (Le Grand Nord), or from Mashi in South Kivu, where it is also found. Murhi-Orhakure (2005:60) describes noun class 19 in Mashi as expressing the inherent “idée de ‘petitesse’” (‘idea of smallness’) as central notion but it may also be used to express an “appréciatif” (‘appreciative’) without notion of diminutive, as in hiryá hinyére ‘that (nice) girl’ (Murhi-Orhakure 2005:60). The nouns of noun class 19 form their plural in noun class 13 marked by the prefix rhu-. The hi- class prefix as used in Kivu Swahili however is more likely to be borrowed/retained from Kinande, where it marks the plural to class 12. In Kinande it does not only mark diminutive or appreciative forms as in Mashi, but also indicates specific (plural) concepts (as in Kivu Swahili), groupings of things such as ehík ı́ŗa ‘petites choses que l’on emporte sur soi’ (‘small things that one carries along, i.e. amulets, a chief’s crown, etc.’) (Kavutirwaki & Mutaka 2012:2), or small quantities of mass items such as éhyunga ‘some drink’ (p.14). Speakers from the northern areas of North Kivu province employ this noun class very often with a plural connotation (Josué Mwanzo Mumbere, p.c. 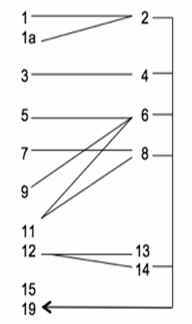 2013); see examples (9a–b). In Kivu Swahili, unlike ECS, concepts of noun class 9 (nyumba ‘house’) regularly form their plural in noun class 6 (manyumba ‘houses’), but maintain noun class 10 agreement on nominal modifiers and subject markers (i.e. manyumba zote ‘all houses’). This is a regular pattern in Kivu Swahili, and can be considered a case of “breaks in agreement” (Schadeberg 1992:21–22), which occurs in ECS, too. Amidu (1997:50) generally refers to similar phenomena as “paradoxes in Kiswahili class systems”. In ECS however, mostly noun class 11 is affected, yet less commonly also concepts of noun class 9, whose plural forms adopt a (noun class 6) prefix ma- only in few cases, while the pronominal possessives maintain noun class 10 concordance, as in mabwana zetu (‘our masters’) or (ma)rafiki zangu (‘our friends’) (both Schadeberg 1992:22). This has become a regular pattern in the variety spoken in the Kivu provinces (see 10). However, slight deviations to this rule occur, when omission of the regular noun class prefix 6 (ma-) takes place. This happens especially in clause-initial position of the noun when followed by modifiers that are plural-marked (see 11a–11b). The omission of noun class prefix 6 reminds of coastal Swahili varieties, where noun classes 9 and 10 are both fully functioning. Speakers explain this clause-initial pattern as free variation, which can be seen as a stylistic feature (Valérie Bahige, p.c. 2013). Speakers are aware of the fact that nouns such as ngambo ‘side’ or nyumba ‘house’ look the same in the singular and plural in ECS, and drop the regular prefix ma- of noun class 6 in order to make the form more prestigious. This affects both nasal-initial lexemes of Bantu origin and lexemes that only exist in the Kivu Provinces, such as chukudu (‘transport bicycle’). This can rather be seen as an esthetic trend than a strict linguistic norm (see also Nassenstein & Bose 2016:85), and when reviewing the recorded texts, speakers would often add the omitted noun class prefix 6 ma- as an optional form (see 11b), while all concord patterns are maintained. This apparent inconsistency can be seen as speakers’ reference to more standardized varieties, as discussed further in Section 5. Further inconsistencies in agreement occur mostly with certain pronominal forms of noun class 7, and occasionally also with noun class 14 and noun class 15. According to many speakers they all have adopted agreement patterns of noun class 9 (i-) as the more common form (see example 12, see footnote 7). Other deviations in agreement are due to semantic differentiation, as shown in examples (13a–13b), where nouns of the same noun class (noun class 6) can trigger two different cross-reference patterns with the head, depending on whether the underlying concept is a singularia tantum (13a) with noun class 6 concordance, or a plural concept (13b) keeping noun class 10 concord patterns. Similar deviations also occur with noun class 14, among others, and are related to the semantic difference between plural diminutives and abstract concepts. In all Congo Swahili regiolects, the use of demonstratives diverges from that in ECS, where dependent demonstratives usually follow the head noun. There are however some exceptions, as pointed out by Ashton (1944:58), who states that (especially) the distal demonstrative -le may also precede the head. Elsewhere she argues that all three forms of the demonstrative “precede or follow the noun, or may stand alone. When these forms precede the noun, this noun has already been introduced or implied” (Ashton 1944:181), while the unmarked form (demonstrative following the noun) does not serve as anaphoric pronoun. According to Ashton, there are three forms of ECS demonstratives, expressing ‘proximity’, ‘non-proximity’, and ‘reference forms’ (-o) “which may only be used for reference” (p. 183). Unlike ECS, Kivu Swahili makes a general distinction between one proximal and one distal demonstrative, without any equivalent to the reference form (-o) (see examples 14a–b), and thus reveals a bipartite system (for example, noun class 1: uyu, ule; noun class 12: aka, kale; noun class 19: iyi, ile) instead of the more common tripartite one. Whenever anaphoric reference is expressed, the distal demonstrative is usually employed (see 14b). In contrast to the ECS pattern, demonstratives in Kivu Swahili always precede the head regardless of their deictic status (see 15a), as is also the case in Kinyabwisha and Mashi. The only exception to this rule is when they occur following adverbials, as illustrated in (15b). Emphatic demonstratives, however (iyi-iyi ‘this very’, zile-zile ‘those very’ etc. ), which are reduplicated forms, do not deviate from ECS (see Mpiranya 2015:34–35). Another deviation from ECS is the use of locative connectives, formed with a connective (‑a) followed by a locative marker (ku, mu), which express the origin of something, or one’s (spatial) belonging to a specific place, in contrast with ordinary connectives that usually express a relationship, ownership or associative connections (see 16a–b). Both are used and differentiated in Kivu Swahili (example 16c), while ECS usually makes use of only one construction for both cases (16a), either with a simple connective or by (additionally) using the locative kwenye (16b) (from an instrumental -enye), which slightly modifies the meaning of the sentence. ECS speakers say that less commonly used constructions such as muigizaji wa kwenye filamu could also be used, thus employing a connective plus locative kwenye construction. In Kivu Swahili, only locative connectives can be employed. Equivalent constructions exist in Kinyabwisha, where the locative connective (-o + locative mu/ku) (18b–c) deviates in its form from the general connective (-a) (18a). The locative noun classes (noun classes 16–18) are still productive in ECS, and also in Kinyabwisha, while they are fossilized in Kivu Swahili. The most salient features in the verbal morphology of Kivu Swahili deviant from ECS include tense and aspect forms in terms of their remoteness, structural divergence (which has to some extent already been investigated by Goyvaerts 2007), as well as several free variations that do not exist in ECS (see for instance Section 2.2 on the use of the narrative past and conditional). Moreover, the copula and its suppletive forms deviate from standardized Swahili (2.3), and the language reveals referential locatives that do not exist in other varieties (2.4). Some of the general deviations from coastal varieties will be treated in the following sections. When analyzing the distribution of tense and aspect markers in Kivu Swahili, it becomes obvious that the entire system deviates from ECS, mainly due to the employment of different tense and aspect markers. A few of them will be discussed in the following. As can be seen in Table 2, the extension -ak- has various functions (see Sebasoni 1967), either increasing remoteness (distal past), or expressing duration and continuation with an iterative character (habitual, durative future). It can historically be traced back to corresponding forms in various surrounding languages, e.g. non-standard forms of Kinyarwanda (such as -ag- in Kinyabwisha), and also in Kihunde where a suffixed derivation -ang- serves as an intensive and repetitive marker (see Kaji 1992); see also example (19). Apart from differences in remoteness due to the omission of some forms, and the structural changes in others, new aspect markers have emerged that are not used in the same way in ECS, such as for instance the experiential perfect. The experiential perfect (called “experiental” by Nurse 2008) has been treated by Comrie (1976) and also by Dahl (1985) who labels it “experiential/existential”. It is mainly used to describe events that happened (at least) once in the past. Kivu Swahili and other Congo Swahili regiolects have a morphological experiential aspect which is formed with the form -li-, merged with a grammaticalized form of the verb -isha (‘to end‘) and the aforementioned suffix -ak-, which in combination serve as a new prefix to the verb root, -lishaka- (see example 20). ECS has no regular morphological form to express an equivalent aspect. The negated forms also reveal certain changes, in analogy with the affirmative forms. The prefix -ya- (-ja- in ECS) is used as the negative form of the perfect (-lisha-) and negates, when combined with a suffixed -ak-, also the experiential (see example 21). The negated forms of the recent past (-li-) and the remote past (-li-…-ak-) are -ku- and -ku-…-ak- respectively. In ECS, free variants of morphological forms are scarce, whereas they abound in Kivu Swahili. The ECS conditional -ki-, normally realized as -ke- in the Kivu Provinces, is occasionally realized as -ka- (example 22), a form which is homophonous to the marker of narrative past, or consecutive events. Speakers’ free choice of either ‑ke- or -ka- (or periphrastically with the conjunction kama ‘if’) as a conditional marker, eventually leads to the narrative past/consecutive -ka- being replaced with -ke-, as optional hypercorrection (see 23). The use of the copula ni and the suppletives, the defective copula verb -ko and the copula verb kukuwa (na), deviates from copula constructions in ECS where the suppletive infinitive is kuwa. In the Kivu Provinces, the uninflected copula ni is used only in an “existential” reading and only with a 3rd person singular and plural subject (Table 3). The negative form of the copula (si) as employed in ECS, is not used in Kivu Swahili. All other copula constructions do not allow the copula ni. They make rather use of the copula -ko, which in ECS has a clear locative notion. This mean that in Kivu Swahili, existential and locative functions have merged into one form -ko. The only exceptions are the 3rd person singular and plural which distinguish between an existential and a locative copula. The third person plural reveals a form biko, due to vowel coalescence of a subject concord ba- with the 3rd person singular form -iko, which results in biko. The suppletive forms for past and future tenses follow the same structural patterns as in ECS. Moreover, the present tense forms of the defective copula verb -ko can be used as a strategy to express assertive focus in both past and future tense. In order to express assertive focus in a copula sentence with a locative reading, the locative copula has to follow the inflected verb form of kukuwa (see examples 24a–b). When assertive focus with identificational/existential reading (as in ‘Peter is a teacher’) is expressed, a construction is used in which ni follows the inflected defective copula verb -ko (25a–b). In combination with the comitative na, the defective copula verb -ko is used to express ‘to have’, literally meaning ‘to be with something/someone‘ (examples 26–27). The inflected copula na of ECS (nina, una, ana etc.) is not employed in clauses indicating possession in Kivu Swahili. Negative forms of ‘to have’ are, in contrast with affirmative ones (see above), identical to those in ECS: The negation marker is prefixed to the construction of subject pronoun and the defective possessive copula (28a). When the defective copula -ko is negated, it has to be followed by the comitative na, a construction which does not describe possession but the state of actual company, or of having something at one’s disposal (28b). One of the most salient features of Kivu Swahili is the use of referential locatives, which are not found in standardized varieties. In ECS the referential locatives -po, -ko, -mo are enclitic and either follow the tense or aspect marker (Polomé 1967:155), or can stand in verb-final position. In speakers’ home languages, such as Kinyabwisha, locative enclitics are used in verb-final position, whereas in Kivu Swahili, locative adverbials are used. They follow inflected verbs, and express the situation of an item (figure) unspecified with regard to the ground (ako) or as moving inside the ground (amo); see (29a, 30a). Examples (29-30) show how these are realized analogically in Kinyabwisha (29b, 30b) with different enclitics. In more standardized varieties, these are equivalent to noun classes 17–18, which do not trigger a specific agreement pattern in Kivu Swahili. The equivalent referential locative derived from noun class 16 (in ECS) is very rare in Kivu Swahili (and does not exist in Kinyabwisha as locative enclitic), and is limited to examples that contain a locative adjunct with the locative adverbial pale (‘over here/over there’). In example (31), the referential locative apo can be triggered by the adjunct pale which usually serves as a locative adverbial. Due to the fact that locative classes are no longer fully productive in Kivu Swahili, pale is not glossed as such, but as an adverbial, which here serves as an adjunct. The referential locative apo therefore always needs an adverbial antecedent. The divergence of peripheral Swahili varieties from ECS is apparent in morphological differences and syntactic features, which differ notably from more standardized dialects. The syntactic order of constituents of ditransitive verbs deviates from the patterns of ECS due to the possibility of double object marking prefixed to the verb. In ECS “only one object can be expressed by an object marker” (Marten & Kula 2007:233). Moreover, verbal derivations are often expressed periphrastically and speakers employ contrastive topicalization as a strategy of emphasis. Relative clauses deviate from ECS patterns in using relative markers that do not exist in coastal Swahili, which are, however, widespread elsewhere among less prestigious varieties of Swahili. Among the outstanding (morpho)syntactic features of Kivu Swahili is the possibility of double prefixed object marking, by object concords referring to both the direct and indirect objects (examples 32a–b), with the fixed order [PATIENT] [RECIPIENT]. ECS in contrast usually allows only one prefixed object concord, and one adjacent pronominal form or a free-standing object; see (32c–d). It has generally been accepted that (among other languages) “Swahili allows only one object marker per verb, while other Bantu languages […] allow more” (Seidl & Dimitriadis 1997:376). Moreover, strict rules regulate which of the two objects in ECS is substituted by an object concord when object marking is optional. In example (32c) this is the indirect object: the prefixed marker for the direct (–human) object would make the sentence ungrammatical (*a-li-ki-pik-i-a); see Marten & Kula (2007:233–234). In Kivu Swahili, agreement marking of two nominal objects has not been observed (unlike in ECS, 32c). It must be noted that also single nominal objects do not get agreement marking on the verb. Null objects, which are expressed neither through prefixation nor explicitly by a noun in object position (cf. in English I know [it/that]! ), are also no common feature, whereas they do occur in Kisangani Swahili (see example 33) and are also “common in [East Coast] spoken Swahili” (Seidl & Dimitriadis 1997:376). Kivu Swahili differs from ECS not only in object marking but also in the frequent occurrence of periphrastic constructions in the place of causative forms. Like other structural features, which have been discussed above, similar construction types can be found in other languages spoken in Kivu (e.g. Kinyabwisha and related languages); they may therefore be classified as contact-induced variation rather than as pidginized or simplified forms. Examples (34–35) show two periphrastic causatives that are expressed with the verbs kutuma (‘to send; to cause’) and kuacha (‘to let; to cause’). Both periphrastic causative constructions reveal a difference in the following tense; while the present and past tense of the causative verb require a following present tense on the second verb form, a causative verb with future tense requires the subjunctive mood. The kutuma construction can be considered a substrate influence from Kinyabwisha; in most Rwanda (JD61) varieties similar constructions are possible. A further syntactic feature of Kivu Swahili not found in ECS is the use of contrastive markers of topicalization, which are juxtaposed after the head (noun) and correspond with the head in terms of cross-reference; they are composed of a comitative na with a following pronominal form. Contrastive topicalization describes a phenomenon which can be translated as ‘as for XY…/As far as XY is concerned…’, and further expresses emphasis. 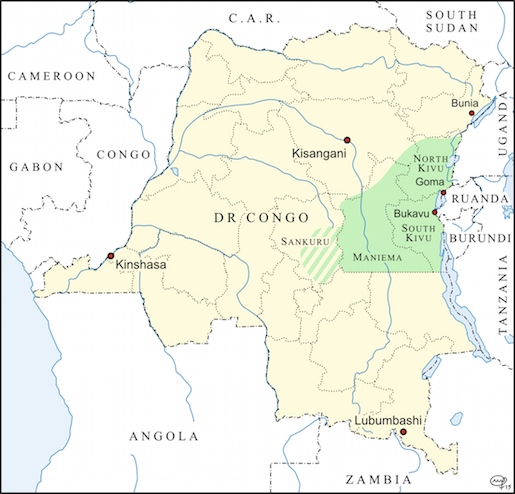 The Kivu Swahili construction has presumably been adopted from Lingala (Bantu C30b), the most widespread national language of the DR Congo (Maho 2009), where a similar construction is employed. In Kenya and Tanzania such a construction is not known (David Barasa, p.c. 2015). Examples (36a–b) illustrate the construction in Kivu Swahili, and examples (37a–b) in Lingala. Note that the Lingala construction does not make use of a comitative plus (anaphoric) pronominal (due to the lack of morphological substitutives), but instead employs possessives. Relative clauses in Kivu Swahili also differ in their form and functions from those in other varieties. ECS employs two main constructions, one based on a free-standing marker amba- as well as on one prefixed strategy that requires relative concords preceding the verb root. In Kivu Swahili (unlike Kisangani Swahili, where three optional construction types are used, allowing speakers to use demonstratives or to omit the relative marker) -enye, which is suffixed to the concord pronoun of the antecedent is the only relative marker (38–39). The same form also works with locative subjects and objects, and is used in the form kw-enye (‘the place where‘) (40). This brief description of the morphosyntax of Kivu Swahili makes it evident that the noun class system is complex (with a distinction of 19 noun classes and their respective concordance) and that most agreement patterns have been maintained, despite some non-agreeing nominal modifiers (e.g. noun classes 3 and 11 taking noun class 9 agreement). The tense-aspect system reveals likewise no particular indications of simplification or pidginization (as often stated; see Heine 1973, Vorbichler 1979), even though notable divergence from ECS can be attested. Many speakers perceive the language, however, as little homogenous and rather characterized by a broad range of variations. These variations are in most cases neither due to speakers’ lack in proficiency, nor based on a lack of grammatical rules, nor on the inconsistent standardization of the language. In contrast, most morphological variations can be seen as a partial acrolectal register that is associated with coastal language use, and which serves as speakers’ reference to more prestigious forms of Swahili, as illustrated in example (41). This sentence stems from a longer narrative in Kivu Swahili produced by the first author. It reveals several morphological agreement patterns from ECS, such as the noun class 2 subject concord wa- on the verb instead of ba-, and the noun class prefix 2 wa- instead of ba-. The usage of these standard forms are not always in harmony with those in ECS, a fact of which the speakers are well aware. This becomes obvious, e.g., when a copula wiko instead of biko (‘they are’) is used. In ECS, a copula wiko (wa+iko) does not exist, and the ECS expression for wiko na ingiya is wanaingia (‘they are entering’). The production of these ECS-like forms can be considered a strategy of hypercorrection (oriented toward a more acrolectal realization). Speakers’ trend toward more standardized forms of Swahili are mostly based on language ideologies that are influenced by (allegedly Western) discourses of linguistic purity, and on the hegemonic dominance of long established missionary grammars over more peripheral, “undocumented” and deviating varieties of the language. This is also pointed out by Ferrari, Kalunga & Mulumbwa (2014:133), who state that “le swahili local [de Lubumbashi/Katanga] était fortement dévalorisé dans les discours épilinguistiques” [the local Swahili was heavily devalued in epilinguistic discourses], which made ECS appear/look “plus ‘pur’, ‘meilleur’ que le swahili dit ‘facile’ de Lubumbashi” [‘purer’, ‘better’ than the Swahili called ‘simple’ from Lubumbashi]. This language ideology has also contributed to the fact that (prescriptive) grammars of Congo Swahili were structurally often much closer to coastal Swahili than speakers’ actual speech in the field, for instance when taking a closer look at Hunter’s (1959) and John & L.F. Whitehead’s (1928) descriptions in colonial times. While “the making” of Kiswahili as an institutional and educational language was based on colonial endeavors (Peterson 2006), it has led to a strict elitist thinking, especially at its peripheries (i.e. in the DR Congo, Rwanda, Burundi, Northern Uganda etc.). In its history, Kiswahili has – despite the initial idea that it would serve as linguistic “tool for all” during colonial and then socialist times (in Tanzania) – always also stood as an exclusive and instrumentalized language, separating speakers of different social classes, and “better” from “less proficient” speakers, and it has separated the epicenter (Zanzibar, the East African coastline) from the periphery. As has been shown, the basics of the standard morphology of the language are known to speakers of the different varieties of Congo Swahili. This is due to its diffusion via mass media (including the international radio stations DW, BBC, Radio Vatican), the Internet, and through contact with the formerly named “arabisé(e)s”, the descendants of East Coast Swahili traders in Maniema and parts of Kivu, who originated mainly from early Muslim settlements as in Nyangwe and Kasongo (Maniema Province) in the 19th century (see Fabian 1986). The preference of more standardized forms of Swahili occurs not only with speakers of Kivu Swahili but can be witnessed throughout the Swahili-speaking parts of the DR Congo. In Kisangani, agreement patterns such as the above mentioned wiko are not unusual. Example (42) reveals concordance with noun class 2, as shown by wa-population wenye wiko; similar cases are said to occur in Lubumbashi (Katanga) as well (Georges Mulumbwa, p.c. 2014). The major contexts in which these standard-like forms are partially employed are either formal situations in which non-ECS speakers tend to make use of more acrolectal (prestigious, more standardized) forms of language, in the academic metalinguistic discourse of Congolese scholars of Swahili, or on Congolese radio channels. Similar adaptive patterns as mimetic forms of standard speech can be witnessed when speakers of Kivu Swahili interact with Kenyan or Tanzanian Swahili speakers. In all other situations, speakers are not striving for ECS forms in interaction. Goyvaerts (2007:31) postulates that speakers’ will to speak “Standard Swahili” is no longer a prevailing motivation among the inhabitants of Bukavu, and that the high status of the standardized form has with time lost importance due to the fact that Bukavu Swahili turned into a “stable variant”, and ECS (called “the H variety”) remains as a variety “used for special occasions” (ibid.). In general, the compact set of morphological forms of pronouns, class- and agreement markers (such as the noun class 2 subject concord) shows speakers’ striving for linguistic prestige when copying the authoritative and hegemonic epistemology whose foundations were laid in the 19th century in the colonial context; this epistemology was noted by early Swahili scholars such as Krapf (& Rebmann) (1850). The understanding of languages as monolithic entities initially seemed to be a mostly Western (and antiquated) view, which is currently being deconstructed (see Makoni & Pennycook 2007, among others). It often goes along with the rejection of non-standardized varieties of the same languages, first by linguists from the Global North, and over time also by local elites. However, the creative language use of peripheral speakers, who make use of a broad repertoire that includes both local (Kivu Swahili) and more standardized (ECS) forms, can also stand as performed critique of a prescriptive and limiting single standard variety, as noted for instance among speakers of Kisangani Swahili, see Nassenstein (2015:25) for a more detailed discussion. In this respect, the orientation toward more standardized (ECS) forms in Kivu Swahili serves as a ‘template’ that does not claim to be perfect, highly proficient or complete. Speakers’ individual repertoires can refer to the standardized variety to varying extents, and the translanguaged use of ECS morphology in Kivu Swahili can become a person’s individual style, and thus an indexical hint of that person’s awareness of the wide divergence of the different Swahili(s). The present paper has provided an overview of the most salient morphosyntactic features of Kivu Swahili, and has aimed to point out forms that have emerged through contact-induced change, and in relation to speakers’ broad linguistic repertoires. Contrary to common claims that remote Congo Swahili varieties such as Kivu Swahili often constitute simplified forms of language, the variety discussed here reveals a complex noun-class system and a verb phrase which allows for the agreement marking of two objects, a feature unknown in Standard Swahili. Various morphosyntactic core features deviate significantly from the standardized form of the language (ECS). However, speakers’ variations often also include forms of more standardized varieties, as expressions of individual stance in interaction and as social critique of linguistic hegemonies (of the center over the periphery). This example of Kivu Swahili illustrates that the focus of the analysis of Swahili has to shift toward the peripheral dialectal and sociolectal variants which are un(der)documented. This would help to eradicate widespread myths about speakers’ alleged insufficient proficiency. It would also show the creative ways in which speakers employ their broad linguistic repertoires. These repertoires are subjective expressions of ideology and awareness of complex hierarchies in metalinguistic discourses on prestige differences, and can, as shown for Kivu Swahili, include the use of a distinct regiolect (Kivu Swahili) which is then adapted to ECS patterns when required in specific contexts. Swahili grammar (including intonation). London: Longmans, Green & Co.
A dictionary of the Suahili language. London: Trubner and Co. The present paper is based on research carried out in the Kivu Provinces (DR Congo) between 2011 and 2015, and seeks to summarize the core features of Kivu Swahili as treated in more detail in a separate sketch (see Nassenstein & Bose 2016). The authors are indebted to Aimée Bose, Valérie Bahige, Josué Mwanzo Mumbere, Emmanuel Twizerimana and Fidèle Kusala for their assistance and the texts and explanations provided, as well as to all other interlocutors from the Kivus. While most speakers originate from Goma in North Kivu, all data compiled were crosschecked with speakers from Bukavu in South Kivu, too. Other speakers consulted in 2013–2014 originated from areas around Uvira in the southern end of South Kivu, and some few from Butembo in the northern parts of North Kivu. We are indebted to Agnes Brühwiler (University of Cologne) and David Barasa (University of Cape Town) for the ECS data. We warmly thank Koen Bostoen (Ghent University) and Georges Mulumbwa-Mutambwa (Université de Lubumbashi) for the useful comments on a previous draft, and Mary Chambers for proofreading the manuscript. We are indebted to Helma Pasch for numerous helpful comments, ideas and for solving formatting problems. All Guthrie codes are based on Maho’s (2009) updated classification of the Bantu languages. Sociolinguistic studies on youth languages and secret languages based on Kivu Swahili are provided by Goyvaerts (1988, 1996) and Nassenstein (2016a). The different varieties of Kiswahili spoken in DR Congo are treated as ‘regiolects’ in the present study (and others) due to their broad diffusion, but also due to their structural variability throughout one region. For instance Kivu Swahili reveals diverging morphology in Goma (North Kivu Province) and Bukavu (South Kivu Province), while the main structural properties (such as the salient features of the noun class system, tense-aspect distinctions etc.) are maintained. Neither a clear dialectal set of isoglosses can be established, due to increasing migration and speakers’ patterns of mobility, nor a single morphosyntactic realization. Congo Swahili varieties are thus prone to broad regional variation. Both noun class prefixes 8 (bi-) and 11 (lu-) can be considered a substrate influence, from various regional languages. It becomes evident that Kivu Swahili clearly differentiates between noun classes 11 and 14, which are only distinguishable to a certain extent in ECS. In Kivu Swahili, they are different in relation to the shape of their noun class prefix, in terms of plural pairing and also in agreement. The distinction between 11 and 14 was most likely reintroduced through substrate influence, since the same difference occurs in most languages from the Kivu provinces. Whenever we deal with invariable non-agreeing or co-refering nominal modifiers, due to a high frequency in use and analogical levelling, morphemic boundaries and noun class agreement are not indicated. Georges Mulumbwa (2016, p.c.) remarks that in the given example certain speakers of Kivu Swahili also indicate a form kile that could be used. Nurse & Hinnebusch (1993:350) assume for Proto-Northeast-Coast-Bantu, Proto-Sabaki and also Proto-Swahili that a noun class 12 (ka-) existed, but was then at a later stage substituted by class 7 in most of Sabaki with some exceptions. While the noun class 11 canonically contains ‘long’ things (cf. Katamba 2003), speakers of Kivu Swahili explicitly explained the prefix lu- as an augmentative marker. Similarly marked evaluative morphology exists in Kinyarwanda varieties spoken in the Kivu provinces. Considering the noun class pairing of noun class prefix lu- (11) and bi- (8), it has to be mentioned that this only works in case of double noun classes (8+6), forming a plural bi-ma-panier (‘baskets’). We are grateful to Georges Mulumbwa for bringing this to our attention. Some noun class 7 agreement patterns lack palatalization when preceding vowels, i.e. kya never becomes cha as in ECS and kenye (example 39) never becomes chenye. In most sources, examples are not glossed, and (tentative) morpheme boundaries were therefore indicated by the present authors whenever possible. The hierarchical value of vowels leads to the merged form of the relative (zi + enye → zenye, i + enye → yenye), which is presented without indicated morpheme boundaries in the glossed examples. The same applies to forms of the connective (ki+a → kya, zi+a → za, etc.) and for instance certain demonstratives, whereas the underlying morphophonological structure is not further displayed. Animals always trigger noun class 9/noun class 10 agreement (with the plural forms taking ma-, as already described), which means that there is no general animate concord in Kivu Swahili. As becomes evident, the occurrence of noun classes 16-18 is restricted to locative markers (for noun classes 17-18) and adverbial locatives (noun classes 16-18, see Section 3.4). We are particularly grateful to Koen Bostoen (2016, p.c.) for this information. A complete list of the TAM system can be found in Nassenstein & Bose (2016). There are different conceptualizations of the progressive construction in Congo Swahili varieties. It is described as a copula+comitative+stem construction by Nassenstein (2015), Nassenstein & Bose (2016), considered a periphrastic construction of “being with a specific action/being in a specific action”. In contrast, Goyvaerts (2007) and also Ferrari, Kalunga & Mulumbwa (2014) rather consider -na- as the same tense-aspect marker also found in ECS. Georges Mulumbwa (2016, p.c.) explains the progressive found in example (40) biko na cheza as a “formatif” (‘tense marker’) and as short form of biko (ba)nacheza, and iko na komala (example 41) as a shortened form of iko (a)nakomala. Also the orthographic representations vary. While the latter suggests to write the form in two words, Goyvaerts (2007) prefers to write the entire construction as one word, and Nassenstein & Bose (2016, present paper) suggest three words. In certain more colloquial varieties of ECS, especially as used in the Tanzanian hinterland, forms similar to the Kivu Swahili ones are employed, as for instance in Ulishagaona tembo? (‘Have you ever seen an elephant?’). We are particularly grateful to Agnes Brühwiler (2015, p.c.) for this valuable information. In the present paper, the suffixed -ak- in Kivu Swahili is therefore sometimes glossed as habitual (hab) when combined with a present tense prefix -na-, or as remote past (pst2) when following a prefixed near past -li-. In ECS, the locative copula is always formed with -ko, and the identificational/existential copula is ni for all persons (see Schadeberg 1992). In ECS, periphrastic causatives are sometimes reported to be formed with the verb -fanya (‘to do’), or also with -acha (‘to cause, let’), see below. I am grateful to Koen Bostoen for bringing this to my attention. We are particularly grateful to Gerrit J. Dimmendaal for his ideas on contrastive topicalization.